Aliases: Master Kodom, "champion of the region"
Powers/Abilities: Kodom Shath was the greatest warrior in a village of non-warriors and was highly thought of amongst his people. He was sufficiently experienced to suspect exaggerations or alternate explanations for seeming monsters. He was experienced in riding a mouse, and in the use of a sword and shield. He was also quite the ladies man, apparently well versed in the arts carnal. However, he was very conceited and disrespectful. He never took a mission without payment, often inflating his charges as he saw fit. His long history of success had made him complacent, but he was cowardly when faced with a real threat. (Savage Sword of Conan#82/2 (fb) - BTS) - Kodom Shath was long known as the greatest warrior of Idlewood. For the right price, he undertook many missions to protect the providence, and allegedly never failed. He was adored by most of the people, and was very popular with the ladies. (Savage Sword of Conan#82/2 (fb) - BTS) - Baf advised Kodom of reports of a great dragon menacing Idlewood. 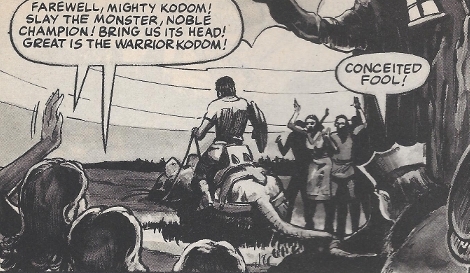 (Savage Sword of Conan#82/2) - Upon returning to Idlewood, Baf showed Kodom a notice offering $50,000 talents to "he who slays the dragon of Idlewood." Unimpressed, Kodom told Baf the dragon was a myth, as all dragons had "perished long ago, or were confined to the westwood." Baf informed Kodom of the two sightings, fearing what would happen if the "dragon" should smell them; he asked if Kodom would distinguish himself. Kodom replied, "Is it not expected of me? Is if not the duty of the greatest warrior in all Idlewood? Yes, Baf, I will kill this creature -- if it exists -- for the right price." Baf excitedly thanked him, knowing he would not fail them, and then offered to lead his steed to the stable. Kodom agreed that Baf could carry his mouse's whiskers and fetch his cheese if it pleased him. As they passed through the village, a trio of women looked out their windows at home, noting Kodom was back from another triumphant battle, that he was wonderful, that he could do anything, and that he was so handsome. As Kodom took a bath in a wooden trough, Baf (waiting with a towel) wondered if Kodom wouldn't arrange an audience with King Mushkan so he could arrange a price for his services. When Kodom replied that Mushkan knew where he was, Baf noted that a king doesn't visit an underlying; but Kodom countered that, as the champion of the entire forest, he did not consider himself in a class with the other rabble...and "it's high time that fat monarch got off his pompous throne. What does he think I am, a common stable boy?" (Savage Sword of Conan#82/2 (fb) - BTS) - Later that evening, Kodom enjoyed the romances of a trio of women (quite likely the same three women who admired him before). (Savage Sword of Conan#82/2) - King Mushkan's page pounded on Kodom's door, interrupting his festivities and informing Kodom that Kind Mushkan demanded his presence at Castle Gorken to enlist him to slay the dragon monster. Kodom told the page to tell the king that he agreed to slay the "troublesome lizard" for twice the offered price, but only after a visit from the king himself; after two days, the price would double. When the page objected, Kodom told him that no other male in the wood had the courage to face a dragon, and the king knew it; he reminded the page that he was called the champion of the region. Kodom further instructed the page to tell that to his "sniveling little king" and to tell him that if he didn't like the offer, he should go kill the dragon himself. The frightened page agreed and fled. Kodom turned back to his trio of bedmates and wondered, "where was I"; each of the three women tried to convince Kodom he was with her. 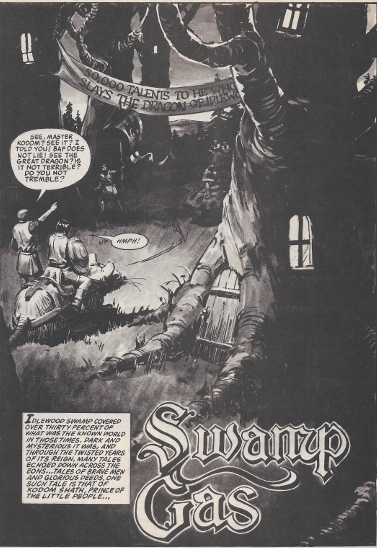 (Savage Sword of Conan#82/2) - When Mushkan appeared on a royal liter and his servant announced the approval of that sum, Kodom instead insisted on $150,000 talents; this page, different from the one before, sputtered the same outrage, virtually word for word, as the previous page, and, while he shaved, Kodom mocked the king, asking if his servants rehearsed the same line. When the king refused, Kodom reminded him there was no one else, and he demanded the full payment in advance, as well as a knighthood, a royal pension when he retired, and the hand of his daughter. The king reluctantly agreed but warned Kodom against trying to leave the providence without slaying the dragon; Kodom denounced this as sacrilege, as "Kodom Shath NEVER fails to compete a mission!" 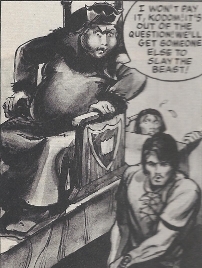 (Savage Sword of Conan#82/2) - While the crowd cheered Kodom Shath as he departed atop his mouse steed, the king muttered how he was a conceited fool. Once on his own, Kodom voiced that this "dragon" was probably a baby salamander some half-witted villager had stumbled over, causing the whole providence to go into hysterics; he planned to put an end to this nonsense. However, he was soon startled to a monstrous bellow, "ROSALIEEEEEEEEE! "...and even more startled to hear the crunching of something large moving through the nearby thicket. As the "dragon" emerged, a terrified Kodom exclaimed "G-G-Great God!" He fled atop his squeaking mouse, yelling for King Mushkan to call his guards, and his armies...and Kodom's insurance company. As Kodom found his path blocked by quicksand, he ordered his mouse to dig a hole or fashion a tunnel...do something! Shouting, "Oh God, here he comes!" Kodom laid down on the ground and began to pray. As he and his mouth covered their heads, the approaching "dragon" was caught with a leash by its owner, the relatively giant Farp, who -- having only seen the mouse (or assumed the other figure was a mouse, too) -- took his pet lizard, Rosalie, home. Comments: Created by Bruce Jones and Joe Chiodo. The story, entitled "Swamp Gas," was described on the title page as a whimsical tale of fantasy. So, if they didn't know there was a race of "giants" living nearby them, why did they call themselves the Little People? Re-reading it, they are referred to the Little People in an introductory narrative, but there's no evidence they called themselves Little People. And didn't any of the normal-sized people notice the tiny quicksand sign and wonder who might have made such a sign? Ah, what's the difference, it was fun anyway. We don't know if this story takes place on Earth-616 or in another reality, but I see nothing that would contradict it being on Earth-616, so that's my vote. The time period seems to the Middle Ages. And where did they come from? And where are they now, the li'l people of Stonehenge...oh, wait...that's the druids from Spinal Tap's Stonehenge...but, regardless, where are they now? 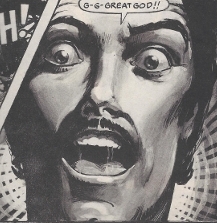 Seeing the "Dragon of Idlewood," Shath exclaimed "Great God! "...perhaps indicating that he is/was monotheistic, or that there was one god who was greatest among the multiple gods he worshipped. When startled, he also exclaimed, "What the devil is that?" Oh yeah, and, when faced with death, he started reciting the "Now I lay me down to sleep" prayer. I calculated his weight based on the formula given to use by our resident engineer in the Official Handbook of the Marvel Universe team, Mike Fichera. Kodom Shath is identified as a prince in the narrative. It is unrevealed whether he is any relation to King Mushkan (they certainly didn't have a cordial/familial relationship, though that's not unheard of), or is a prince under some other king...or maybe it's just an honorary title. One of the Little People, Baf either served as Kodom Shath's squire, or something. Farp was a normal human living not far from the Little People of Idlewood. He worked as a stable boy, and was a source of continual disappointment to his abusive mother, who called him "fool," "pathetic oaf," "imbecile," "moron," and "jello-brained wombat." She also told him he lacked the brains god gave a centipede. He and his mother were the owners of the lizard Rosalie. They apparently lived as common folk in some larger kingdom. (Savage Sword of Conan#82/2) - While Farp snacked on an apple at home, his mother swatted him with her broom, chastising him for always eating and asking why he didn't go out and make something of himself. When he replied that he didn't have enough money for a steed and he wasn't big enough to be a warrior anyway besides having painful arches, she warned him she'd give him something that would hurt and swatted him with the broom again. She wondered how she had birthed such an imbecile, and asked what more she could give him to improve his worthless life; when he suggested another bowl of mush, she literally kicked him out of the house and told him to go find Rosalie, who, at least had some brains. She told him not to come back without her. As Farp looked behind their house and called for Rosalie, his mother swatted him again. He said he wished she wouldn't do that, but she yelled that if Rosalie was behind the house, she'd have found Rosalie. She sent him to check in the clover by the big lake. Farp expressed his fear of the swamp and the things he thought were out there (things with yellow eyes, two heads, and six toes), she ordered him to get moving and further warned that if he didn't bring Rosalie back by Wednesday, she'd soak his corns in vinegar oil. Shielding himself from further hits, he agreed and ran off. Calling for Rosalie near the big lake, Farp pitied himself and feared he would be eaten up by "a slow-footed gnarl-whapper," or a "double-nosed toad-dunker." The next time he called out, a mouth flew into his mouth and choked him. Screaming that he had been gotten by the "invisible six-armed gully-whomper," he panicked and ran forward, knocking himself out against a tree branch...after which the moth flew out of his mouth unharmed. Shortly thereafter, Farp saw Rosalie and caught her as she prepared to feed on mice (Farp did not realize one of the mice was actually Kodom Shath of the Little People). Farp snared Rosalie with his leash, called her a bad girl, and began taking her home as he told her his mother had been worried sick about her. Farp's mother was a normal human living not far from the Little People of Idlewood. She continually verbally and physically abused her son, whom she apparently liked less than their pet lizard, Rosalie. 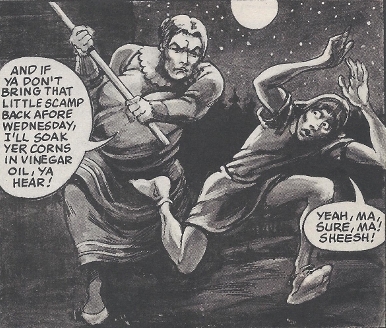 (Savage Sword of Conan#82/2) - Disgusted with Farp for always eating, she struck him with her broom and wished he'd go out and make something of himself. When he claimed to be too poor, too weak, and to have painful arches, she gave him another whack with her broom. Utterly disgusted with lack of motivation or intelligence, she literally kicked him out of their house and sent him to find Rosalie and to not come back without her. As Farp looked behind their house and called for Rosalie, his mother swatted him again, yelling that if Rosalie was behind the house, she'd have found Rosalie. She sent him to check in the clover by the big lake and further ordered him to get moving and further warned that if he didn't bring Rosalie back by Wednesday, she'd soak his corns in vinegar oil. (Savage Sword of Conan#82/2 - BTS) - Farp snared Rosalie with his leash and began taking her home as he told her his mother had been worried sick about her. (Savage Sword of Conan#82/2 (fb) - BTS) - To the Little People's perception, Idlewood Swamp covered 30% of the known world. Dark and mysterious it was, and through the twisted years of its reign, many tales echoed down across the eons...tales of brave men and glorious deeds. (Savage Sword of Conan#82/2) <According to Kodom Shath> - All dragons "perished long ago, or were confined to the westwood." 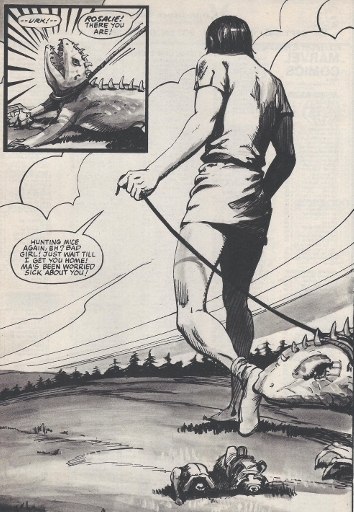 (Savage Sword of Conan#82/2 (fb) - BTS) - A "dragon" (actually Rosalie, a pet lizard owned by Farp) was twice spotted near the village of the Little People. (Savage Sword of Conan#82/2 (fb) - BTS) - The "dragon" was again spotted, this time closer to the village than the first. (Savage Sword of Conan#82/2) - Kodom Shath returned to Idlewood and enjoyed a night with a trio of women. At great expense, he was enlisted by King Mushkan to slay the "Dragon of Idlewood." 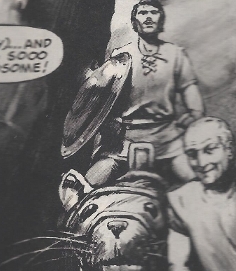 (Savage Sword of Conan#82/2) - The crowd cheered Kodom Shath as he departed atop his mouse steed. (Savage Sword of Conan#82/2 - BTS) - Confronted with the relatively immense Rosalie, Kodom fled and tried to hide, while Rosalie was recaptured by her owner, Farp. (Savage Sword of Conan#82/2 (fb) - BTS) - To the Little People's perception, Idlewood Swamp covered 30% of the known world. 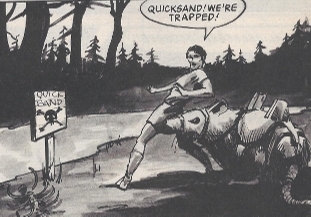 (Savage Sword of Conan#82/2 (fb) - BTS) - One of the Little People, presumably, put a "danger quicksand" type sign up by a quicksand bog. (Savage Sword of Conan#82/2 (fb) - BTS) - King Mushkan had a banner posted, offering 50,00 talents to "he who slays the dragon of Idlewood." The mouse was Kodom Shath's steed. It wore a saddle and a bridle and carried him back and forth between Idlewood and wherever Shath went on missions. (Savage Sword of Conan#82/2) - Kodom Shath returned to Idlewood atop his steed. When Shath agreed to slay the dragon if the price was right, Baf offered to lead his steed to the stable, and Shath told Baf he could carry his whiskers and fetch his cheese if it pleased him. Later, Shath mounted up his steed and departed Idlewood before a cheering crowd. Soon enough, both Shath and his steed were started by the appearance of the immense "dragon" Rosalie emerging from the bushes. Fleeing and squeaking in terror, the mouse stopped as it approached a latch quicksand bog. As Shath grabbed the mouse by its whiskers and ordered it to dig a tunnel or "Do something! ", the mouse just stared back at him. As Rosalie closed on them, Shath and the mouse both covered their heads, but Farp caught up to Rosalie and stopped her from eating them. (Savage Sword of Conan#82/2 - BTS) - The King sent a page to enlist Kodom Shath to summon Kodom Shath to Castle Gorken to enlist him to slay the "Dragon of Idlewood" Shath insisted on $100,000 talents, twice the offered payment, but only after Mushkan came to him and asked him personally; after two days, the price would double. When the page objected, Kodom told him that no other male in the wood had the courage to face a dragon, and the king knew it; Kodom further instructed the page to tell that to his "sniveling little king" and to tell him that if he didn't like the offer, he should go kill the dragon himself. 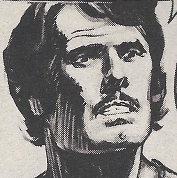 (Savage Sword of Conan#82/2) - Though upset by this disrespect, King Mushkan soon appeared on a royal liter, and another servant announced the approval of that sum. Kodom instead insisted on $150,000 talents; this page, different from the one before, sputtered the same outrage, virtually word for word, as the previous page, and Kodom mocked the king, asking if his servants rehearsed the same line. When the king refused, Kodom reminded him there was no one else, and he demanded the full payment in advance, as well as a knighthood, a royal pension when he retired, and the hand of Mushkan's daughter. The king reluctantly agreed but warned Kodom against trying to leave the providence without slaying the dragon; Kodom denounced this as sacrilege, as "Kodom Shath NEVER fails to compete a mission!" (Savage Sword of Conan#82/2) - While the crowd cheered Kodom Shath as he departed atop his mouse steed, the king muttered how Shath was a conceited fool. (Savage Sword of Conan#82/2 - BTS) - Fleeing from the relative giant "dragon," Rosalie, Shath yelled for King Mushkan to call his guards, and his armies...and Kodom's insurance company. Rosalie is some sort of lizard, perhaps in the monitor family (she apparently enjoyed feeding on mice), though I'm not familiar with any of those having such spikes on their heads. (Savage Sword of Conan#82/2 (fb) - BTS) - Rosalie was a pet owned by Farp's mother; she seemed to like Rosalie better than her own son (she remarked that there was at least one family member with brains <Rosalie>). (Savage Sword of Conan#82/2 (fb) - BTS) - Rosalie tended to wander off. She liked to walk in the clover by the "big lake." (Savage Sword of Conan#82/2 (fb) - BTS) - Rosalie was twice spotted near the Idlewood village of the Little People, who considered the relatively monstrous lizard to be a dragon. (Savage Sword of Conan#82/2 - BTS) - Rosalie got away again, and Farp's mother sent Farp to find her...and to not come back without her. 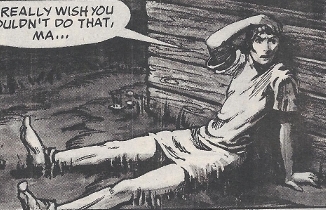 (Savage Sword of Conan#82/2 - BTS) - When Farp looked behind his house and called out for Rosalie, his mother told him to look further away, as she'd have found Rosalie if she was so close to home. Amidst the swamp, Farp called out for Rosalie until a mouth flew into his throat, after which he fled and briefly knocked himself out. 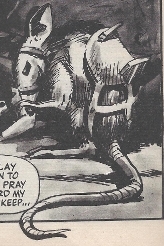 (Savage Sword of Conan#82/2) - Rosalie wandered out of a thicket and encountered Kodom Shath and his mouse steed. Kodom fled, trying to call for help, while Rosalie, apparently wanting to feed one what appeared to be two vermin, chased after them. Trapped by quicksand, Kodom Shath laid down and prayed and then covered his head (and his mouse steed followed suit); but before Rosalie could consume either of them, she was snared by Farp, who headed back to the swamp with her.